As the power costs rising all the time, we’re more conscious than ever of saving energy – and money. Low energy lighting is about reducing the wattage used in a light fitting while maintaining similar light output. Generally, the electric lighting consumes up to 25% of the average home energy bill. The electricity used over the lifetime of a single incandescent bulb costs 5 to 10 times the original purchase price of the bulb itself. The rapid development of LED bulb technology is bringing newer LED bulbs to the marketplace which is safer, longer lasting and more efficient than today’s CFL bulbs. The selection of right or appropriate type of LED bulb is more important the diverting from an incandescent to LEDs bulbs. In this post, you will get to know the difference between CFL & LED bulbs, various types, main advantages and selection criteria for the LEDs compared to CFL or incandescent bulbs. 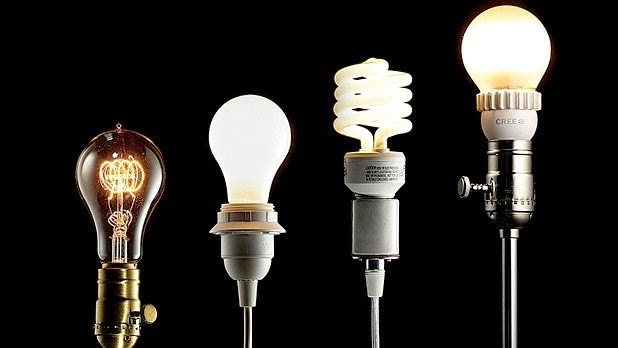 Light Emitting Diode (LED) and Compact Fluorescent Lights (CFL) bulbs have revolutionized the energy efficiency lighting compared to the incandescent bulbs in recent times. CFLs are simply miniature versions of full-sized fluorescents while LEDs are small, very efficient solid bulbs and brings more value to the consumers. New LED bulbs are grouped in clusters with diffuser lenses which have broadened the applications for LED use in the home. In fact, LED technology is advancing rapidly, with many new bulb styles available. Initially LEDs were more expensive compared to CFLs due to lack of advance technology in place. At present the price of LED bulbs is going down each year due to the improved manufacturing technology and more awareness about energy conservation among people. LEDs were limited to single-bulb use in applications such as instrumental panels, electronics, pen lights and, more recently, strings of indoor and outdoor decorative lighting. The first clustered bulbs were used for battery powered items such as flashlights and headlamps. Today, LED bulbs made using as many as 180 bulbs per cluster, and encased in diffuser lenses which spread the light in wider beams. Now a day, LEDs are available with standard bases which fit common household light fixtures. LEDs are the next generation in home lighting. The main feature of LEDs is that the light is directional, as opposed to incandescent bulbs which spread the light more spherically. The high cost of producing LEDs has been a demerit to widespread use. However, researchers have developed a process for using inexpensive silicon wafers to replace the expensive sapphire-based technology. This will bring the LEDs into competitive pricing mode with CFLs and incandescent bulbs. LEDs may soon become the standard for most household and commercial consumers for their lighting needs. Most LED bulbs in use today are clear or white bulbs, commonly available in ‘cool’ or ‘warm’ while light. However, LEDs are also available in colours and used as individual bulbs, or in clusters, for special applications. Generally, LEDs are also available in different colours such as red, blue, green and amber. LED bulb use was first adopted commercially, where maintenance and replacement costs are expensive. But the cost of new LED bulbs has gone down considerably in the last few years. In fact, the cost is continuously coming down with improved technology development. As per estimates, LED light bulbs use only 2-17 watts of electricity (1/3rd to 1/30thIncandescent or CFL). It remains cool, saves electricity & money on replacement costs due to increased serving life. Small LED flashlight bulbs will extend battery life 10 to 15 times longer than with incandescent bulbs. Since LEDs do not have a filament, they are not damaged under any circumstances when a regular incandescent bulb would be broken. LED bulbs are solid in construction and hold up well to jarring and bumping. LEDs produce 3.4 Btu’s/hour compared to 85 for incandescent bulbs and cools the surrounding. This helps to reduce the air conditioning costs in the home. How to choose a LED light bulb? New LED bulbs are available in ‘cool’ white light, which is ideal for lighting purpose while ‘warm’ light commonly used for accent or small area lighting. Read the package to choose desired brightness level. You can use wattage to compare bulb illumination. For example, a 9W LED is equivalent in output to a 45W incandescent. However, the new method for comparing bulbs is lumens. Lumens is the measure of perceived brightness, and the higher the lumens, the brighter the bulb. The chart below shows the amount of brightness in lumes you can expect from different wattage light bulbs. The most efficient among all is LED bulbs which are more energy-efficient and long lasting than the other types of bulb. Do you require a 3-Way bulb? New bulbs are available as combination 3-Way bulbs. These replace 30, 60 and 75-watt incandescent bulbs, while consuming 80% less power than an incandescent bulb! LEDs are available in several types of ‘pin’ sockets or the standard ‘screw’ (Edison) bases for recessed or track lighting. Some LED bulbs are now available as dimmable bulbs which will work on your standard dimmer switch. Do not buy cheap bulbs from the market. They are inexpensive because the bulbs use a low-quality chip which fails easily. Also, look for certified bulbs which show FCC, Energy Star and UL. We could save huge money on our electricity bills, and contribute towards building a better environment. And most importantly, energy efficient LED bulbs reduce the energy consumption and therefore help cut greenhouse emissions that are harmful to the environment. Let’s use these highly efficient LED bulbs which reduce our energy costs and subsequently save our environment.